Hey there my sweet crafty friends. I know it has been a while since I have shared anything crafty, well all I can say is life just happens sometimes. Anyways, today I’m here with a quick post of a card I made with one of my newest digi stamp sets. 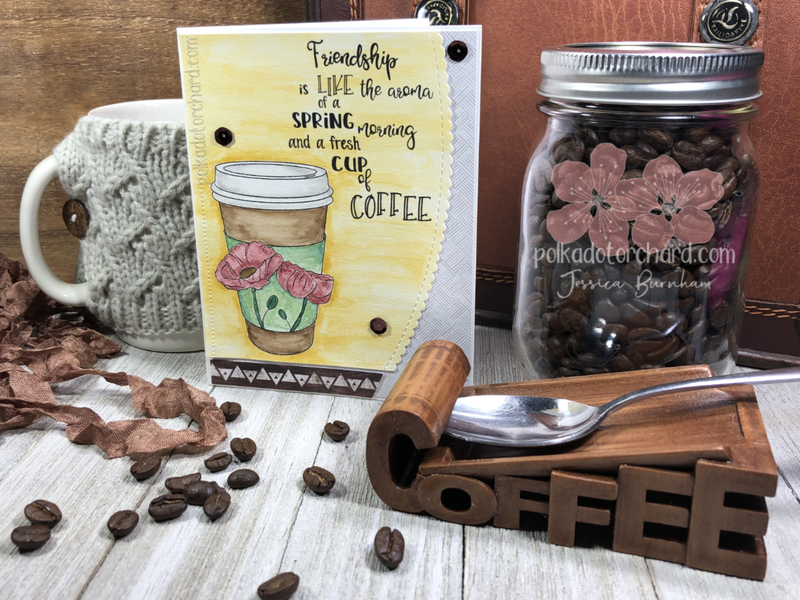 This pretty coffee cup and awesome sentiment are both from the Polka Dot Orchard Flowers In Bloom digi set. 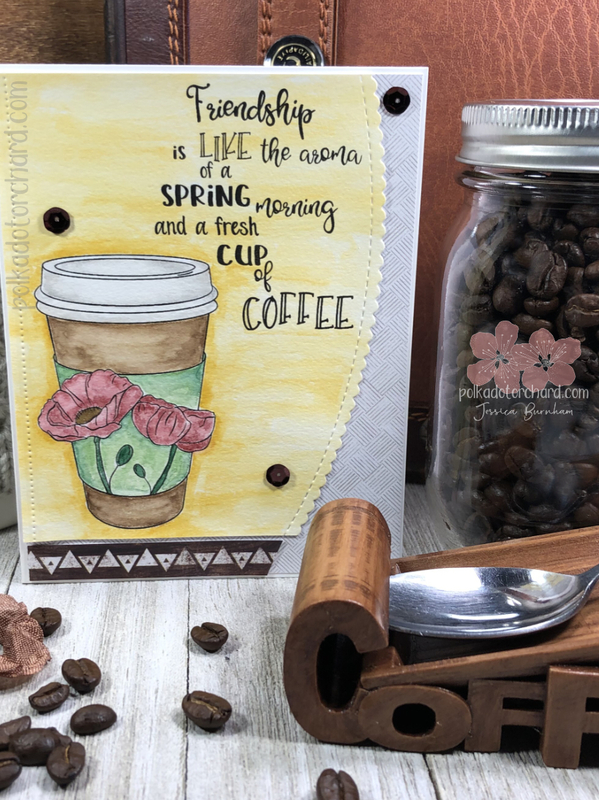 I printed the image and sentiment out on Canson 90lb watercolor paper and painted with Prima Watercolor Confections. After all was dry I cut one side with a nice curved scalloped stitches die from craft stash and then used the piercing die from Lawn Fawns Stitched Borders die set to add just a bit more detail. I then layered the watercolor panel on top of some pattern paper and added a small strip of coordinating pattern paper right below my image panel. To finish up I added a few brown sequins. 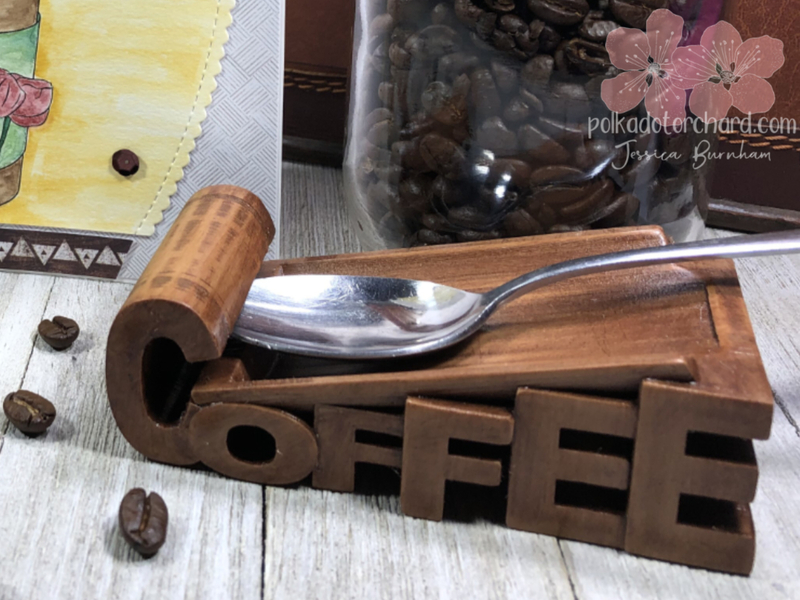 One more thing before I go… How cool is that coffee spoon rest?? My amazing husband made it for me. I’m trying to convince him to let me sell it in the shop, at least as a pre-order. I think he is close to saying yes. Well, that’s it for now. I’ll be back soon with more PDO inspiration. I would love to see what you create with my digi stamps so I created a Facebook group ~Friends of Polka Dot Orchard~ A place just for you to share all things made with my images, please make sure to join it. Join here! Make sure to sign up for my newsletter so you can stay up to date on what’s new and to receive special coupon codes for my digi’s.